Editor's Note: Follow the latest tweets from CNN correspondents from the protests. Send your video, images to CNN iReport. 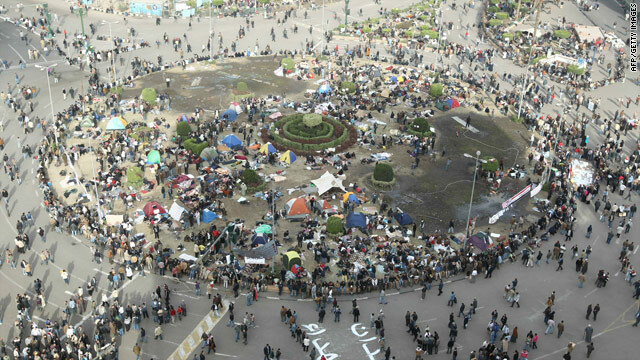 Cairo, Egypt (CNN) -- A record crowd in Cairo's Tahrir Square swelled Tuesday afternoon, a sea of Egyptians from every walk of life in a demonstration dubbed the "march of millions." Tens of thousands prayed on their knees on the asphalt in unison under the sprawling city's winter sun, and then chanted "leave, leave" in a deafening roar to their president, Hosni Mubarak. As the throngs congregated, Egypt's Nile TV showed live pictures of car traffic crossing a bridge over the Nile River, with bulletins announcing that a curfew would be imposed again on Tuesday starting at 3 p.m. Soldiers and plain-clothed security officers searched demonstrators and controlled access to Tahrir, or Liberation Square, which has been the focal point of protests against Egypt's embattled Mubarak, 82. After the first lines of security, scores of self-appointed volunteers from the protest movement conducted their own searches of bags, and ordered arriving people to show their identity cards as they streamed in. One man handed out leaflets, urging demonstrators to behave in front of foreign journalists covering the event. "As you know all media organizations are here to follow your efforts," the leaflet read, "In order to show Egypt in a positive light, we insist that you follow a peaceful approach in expressing your requests and ideas." Men and women continued a practice that has sprung up here over the last week... standing alone in the street, holding up hand-made signs, and posing proudly for the cell phone photos of passers-by. "Mubarak has been here since Ronald Reagan," shouted one man, who held up a sign that said "Get Out Mubarak" in English. Said El Sisi, 23, said he and his father and brother traveled two hours on five different buses from their village outside Cairo to attend the demonstration. "I'd like to see change in my country," El Sisi said, as he walked slowly with hordes of people through security checkpoints towards the square. "I'd like to see a president in Egypt every eight years like in other countries. ...this is just the country of rich people. I graduated from university and I speak four languages but I can't find a job because of nepotism and corruption. To do anything you have to pay money." Many Egyptian opposition parties have embraced today's demonstration, which was promoted through fliers and leaflets, since the government has shut down almost all of the internet connections in the country. "Today we are all together in Tahrir Square," said George Issac, a member of the opposition group Kefaya, which means "Enough" in English. "This revolution is a revolution of the young generation. We are just supporters," Issac said. He claimed Egypt's long repressed opposition parties were working together with one goal, to remove President Hosni Mubarak. In another part of Cairo, an aide to Ayman Nour said the former opposition candidate for president was holding talks with officials from the liberal secular opposition Al Wafd party. "You can not call us Kefaya or Muslim Brotherhood or leftists or anything," Issac explained. "We talk today as Egyptians." But Issac also said his party opposed the announced goal of some demonstrators, who planned to march from Tahrir Square to the Presidential Palace. "I send a message for all the demonstrators. Don't leave the square," Issac said, in a telephone interview with CNN. A march of tens of thousands of people, if not more, would put the protesters in tense confrontations with the Egyptian troops who have established checkpoints throughout the city. At the outskirts of Tahrir Square, army officers drove a truck blaring patriotic music from loudspeakers. On Monday, the military announced it would not use force against the demonstrators. "The presence of the armed forces in the Egyptian streets is for your benefit to protect your safety and peace," an unnamed military spokesman announced on state television Monday night. "Your armed forces will not use violence against this great people, who have always played a significant role in every moment of Egypt's great history." And deeper in the throngs of jubilant protesters, one of the men who searched arriving participants wore a camouflage military uniform underneath civilian pants and jacket in an apparent effort to blend in with the crowd.